Criss Cross Filtered Cigars are becoming the go to choice with a growing number of people now preferring a smaller filtered cigar over their expensive retail brands. These discount filtered cigars are also preferred by seasoned smokers all over the world for their rich, smooth and minty flavors. Each Criss Cross filtered cigar is packed full of high-quality blends of premium tobaccos, wrapped in a thin tobacco leaf paper that allows the burn to be natural and soothing instead of harsh burning chemicals. Additionally, these premium filtered cigars include a slightly longer filter that provide an "Easy Draw" draw, without all the stray flakes and extra heat. Criss Cross Filtered Cigars are produced and distributed nationwide by SX Brands in the USA. 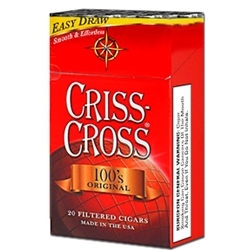 All Criss Cross Tobacco brands is available at our online tobacco store in unique styles to choose from. Full Flavor, Menthol, and Smooth. Smokers Discounts believes Criss Cross Filtered Cigars can be the right fit for your everyday smoking needs, and we can deliver these premium smokes right to your front doorstep. A variety of flavors are listed below. Each of these styles are in stock and available for a low discount price! Call us for more details!